Zii is the way to go for Creative. Creative CEO Sim Wong Hoo shared his vision and a totally new Creative with a new product line and business model. Zii is the answer to the NEW Creative. Although now, the Zii Egg for developers were already shipping around the world. But we have not heard of any exciting Zii products as the result of the 'Shan Zhai' marketing strategy which is widely popular in the China market. CEO Sim promised that Creative will have its own line of Zii products for consumers and stressed that the Zii is highly flexible which can evolved into highly popular products such as mobile phones, TV set-top boxes, video conferencing systems, digital signs, netbooks, eBooks and other mobile communication devices. Hopefully we can all see the light at the end of the tunnel. Come on Creative! You can do it! In my message last year, I shared our vision to create a totally new Creative, with a new product line and a new business model, leveraging on the innovative technologies we have developed over the years which will again see Creative set a major trend in the industry and open up opportunities for all. We started unveiling this vision with the launch of our System-on-Chip, the ZiiLABS ZMS-05 SoC, and the Zii Platform, ushering in the era of StemCell Computing. The Zii Platform includes our Plaszma OS, Plaszma SDK and the Zii EGG for developers, which runs the Plaszma OS or Android OS. The Zii Platform also includes the ZMS-05 System Module, a compact, media-rich module targeted for outside developers and OEMs to use with Plaszma software to significantly reduce the design and manufacturing complexity in creating next-generation devices and applications. With our Zii Platform and the ZMS-05 System Module, we now have solutions to sell into the huge 'Shanzhai' OEM market in China, which is a key part of our new business model. We recently announced our 'Shanzhai' OEM Marketing Program that will outreach and build demand in this burgeoning OEM market. The 'Shanzhai' OEMs and other enterprising organizations around the world may not have brands of their own, but they do have an insatiable appetite for ready-to-go technologies, and can adapt quickly to new market opportunities. Using our Zii Platform and ZMS-05 System Module, these enterprising OEMs can leverage on our state-of-the-art technologies and brand equities to rapidly bring a plethora of high quality and low cost Ziipowered products to market. These products can possibly include mobile phones, TV set-top boxes, video conferencing systems, digital signs, netbooks, eBooks and other mobile communication devices. In addition, we plan to utilize the Zii Platform in a new line of our own Zii-branded products, including portable media players, speakers, audio solutions and other personal digital entertainment devices. The development of the Zii Platform has required a significant ongoing investment in research and development. Now that we are bringing the Zii Platform to market and beginning to deliver on our new vision, we will also require a substantial investment in marketing to build our new business model. We are prepared to make these strategic expenditures, as our strong cash position of over US$250 million provides us with the financial flexibility to continue to invest in the development and marketing of the Zii Platform, and to take advantage of the opportunities for new product lines and businesses offered by the Zii Platform. Our strong cash position was a bright spot in an otherwise difficult and challenging fiscal year for Creative, with an extremely turbulent and uncertain global economic environment. With the onset of the unprecedented crisis in the global financial markets and the resulting global economic downturn, we took aggressive measures to position Creative to meet the challenges in the tough period ahead of us. We undertook a complete restructuring of our worldwide sales and marketing operations, including closing or consolidating certain operations that were too costly or underperforming. We significantly lowered our operating expenses by sharply reducing our international headcount and infrastructure costs, primarily in Europe and the US, while simultaneously driving down our inventory position, substantially reducing inventory exposure. The global economic downturn had a negative impact on the demand and selling prices for our products across all product categories and, combined with the closure or consolidation of certain businesses, resulted in substantially lower revenues and gross margins for the year. Sales for fiscal year 2009 were US$466 million, 37% lower than the previous fiscal year sales of US$737 million. Gross profit as a percentage of sales came in at 17% in fiscal 2009, down from 22% in fiscal 2008. Net loss for fiscal 2009 was US$138 million, compared to a net income of US$128 million in fiscal 2008. Net loss for fiscal 2009 was impacted by the lower sales and gross profit in the year, and restructuring charges of US$11.2 million, exchange losses of US$24.9 million, investment losses of US$13.2 million, and a provision ofUS$12.8 million for potential unrecoverable advances due from a former subsidiary that had been divested in 2007. Net income for fiscal 2008 included a US$148 million gain from the sale of Creative's headquarters building (Creative Resource) in Singapore, an exchange gain of US$14.6 million, an investment gain of US$18.8 million and restructuring charges of US$II. 7 million. During the 2009 fiscal year, we repaid the entire US$100 million outstanding balance of our syndicated term loan. We are now practically debt-free, with no bank borrowing and a strong balance sheet with over US$250 million in cash. Notwithstanding the challenges from the adverse market conditions during the year, we continued with our research and development efforts for our current product lines in areas that hold promise for the future, and introduced exciting new products in each category. In our audio business, we expanded our market potential, launching the Sound Blaster Wireless for iTunes together with Wireless Receivers, the first time we have targeted the huge base of iTunes users on both the PC and the Mac. Sound Blaster Wireless for iTunes allows users to significantly improve the audio quality of music, movies and games on their notebooks and play them wirelessly through speakers in any room in the home. We also extended our Sound Blaster X-Fi product line by introducing the PCI Express Sound Blaster X-Fi Titanium FatalIty Professional Series and the PCI Express Sound Blaster Titanium FatalIty Champion Series sound cards. These high-performance sound cards unleashed the full power of our X-Fi technology and EAX ADVANCED HD audio processing. For the multimedia speaker business, we announced our highest-end GigaWorks T3 speaker system that delivers audio precision in style. We also updated our main speaker offerings with the introduction of the GigaWorks T40 Series II and GigaWorks T20 Series II, and the Inspire T3200 and Inspire T6200 speaker systems. For our headphone business, we introduced the ultra-lightweight and stylish Aurvana Air earphones, the latest addition to our ,premium Aurvana designer earphone series. We also extended our earphone offerings with the introduction of the Creative EP-630 in-ear stereo earphones in a variety of fun and exciting colors, and the Creative EP-430 noise-isolating in-ear earphones. For the PC gaming market, we unveiled the Sound Blaster Arena Surround USB Gaming Headset, the Creative Fatal1ty Professional Series Gaming Headset Mk II and the Digital Wireless Gaming Headset HS-1200. These high-performance headsets provide gamers with our advanced proprietary audio technologies to further enhance their gaming experiences. To differentiate our MP3 players in a highly competitive global MP3 market, we added our X-Fi audio technology to the high end of our product line with the introduction of the Creative ZEN X-Fi early in the fiscal year, followed by the Creative ZEN XFi2 in September 2009. These are the only players that have award-winning X-Fi audio enhancement solutions that significantly improve the quality of MP3 music playback. We also introduced the Vado Pocket Video Cam, followed by the next generation Vado HD Pocket Video Cam. The user-friendly Vado HD allows users to shoot videos in high definition, easily share them online, and play them back in true HD on an HDTV with our HDMI connection. Looking ahead, the global economic outlook remains uncertain, and the overall market for Creative's current products remains difficult and unpredictable. However, with the aggressive restructuring efforts we have taken, we are now a much leaner company with a lower operating cost structure, which allows us to weather these challenges and positions us well when the global economy recovers. 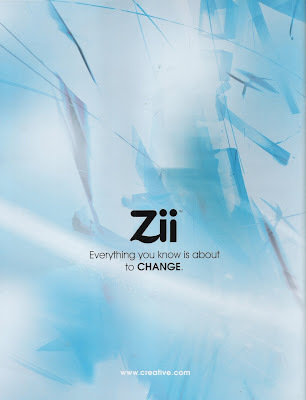 With Zii, I see a bright and exciting Creative finally emerging in the horizon.